Public Enemy sniped at him late in the decade on the Fear of a Black Planet LP, but what were they on about? Sure, he had an ego as big as a Macy’s day float, but let’s not pretend that every single other professional athlete, in every single other sport, scurried around as quiet and deferential as a church mouse. Sports has always been populated with blowhards, it’s just that some have the goods to back it up. Reginald Martinez Jackson had those goods. Not to mention that at least 80% of what he said actually made sense. He’s a bright, articulate guy. But that is not why he’s a first ballot Hall of Famer. He was a big man, barrel-chested and broad-shouldered, naturally gifted without a doubt, but also a fitness freak in an era when most baseball players treated their bodies like the pull tab on that last can of National Bohemian they had just guzzled. (Don’t forget he spent 1976 in Baltimore!) Reggie’s near 70 now and he will still slap you down if you want to get lippy. 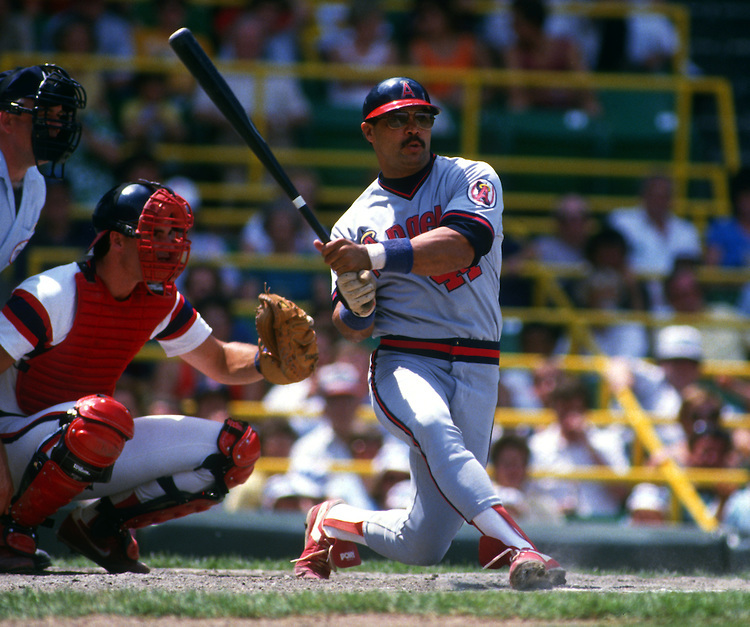 Most people remember him in green and gold or blue pinstripes on a white ground, and why not, he was absolutely iconic in both places, but I prefer to remember him from 1982-1986 when he wore the white (later light gray), navy and red of the California Angels. He was a solid performer for them, even as his career was winding down. By the way, I still refuse to acknowledge the name my favorite team goes by today, the Orange County Angels of Los Angeles as presented by the Jack in the Box on the corner of East Gene Autry Way and South State College Boulevard or whatever the hell it is. They’ll always be the California Angels to me. Reggie was clean, he was clutch, his dingers were divine. I love the man.